The posture of this week in Tatty Bumpkin classes is MOUSE pose, in the sessions your child will go on an adventure with Tatty Bumpkin and help Mouse find his perfect house! Kneel on the floor with your bottom on your heels and your arms by your sides. Now curl forward and pretend to ‘kiss your knees’. Take deep breaths and lie very still. Shut your eyes. Imagine you are a very tiny mouse. Kneel up and wriggle your fingers by your nose like whiskers, and scamper away! Shake a leg out and pretend it is the mouse’s tail. Make sure you shake out your other leg, as you are a magic mouse with TWO tails. When your child curls into mouse pose they will stimulate their ‘deep touch’ body sense, their proprioceptive sense, and this promotes feelings of calmness. 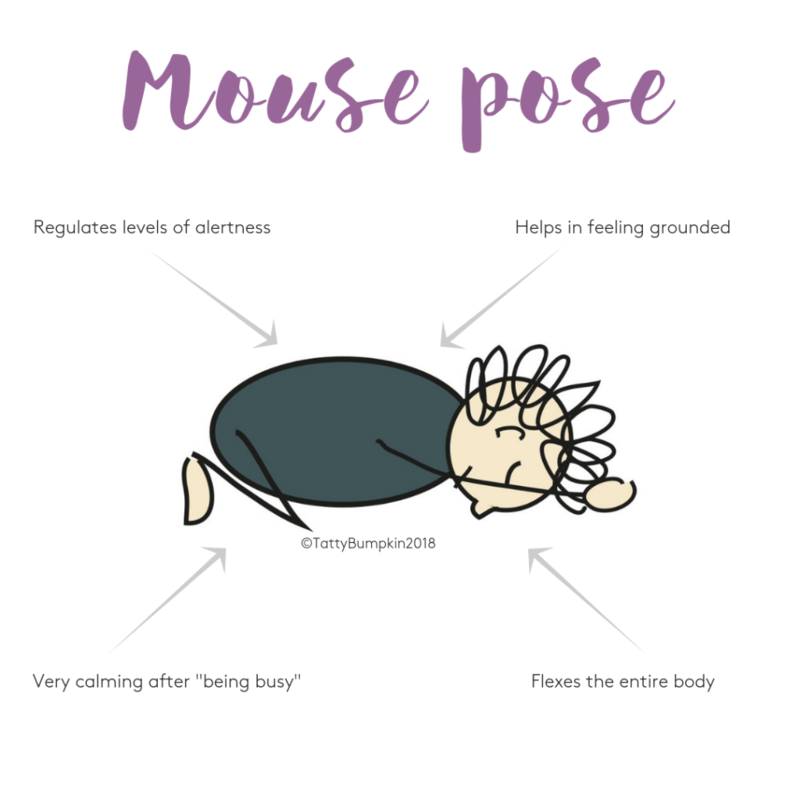 Hence mouse pose is an excellent pose for your child to do when they need to calm down and lower their levels of excitement or ‘alertness’. Learning to regulate their own ‘levels of alertness’ is an important skill for your child, as by doing this they will be able to help themselves keep at that ‘just right level of alertness’ for learning. To promote your child’s fine motor skills, encourage your child to wriggle their fingers and ‘twitch their mouse whiskers’. This will help to strengthen their fingers and wrists for skills such as writing and doing up buttons. 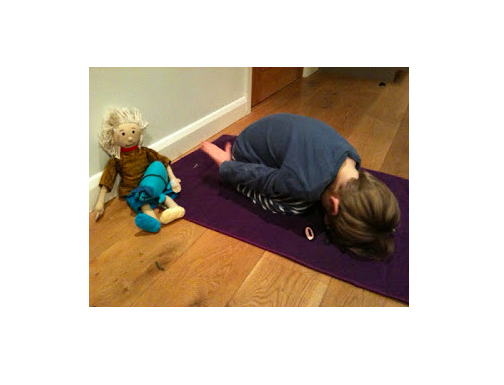 Through the magic of a Tatty Bumpkin class mouse pose can become both a multi-sensory and an educational activity. In Tatty Bumpkin classes we always try to stimulate a variety of senses, to add to the fun, give choice & to help the learning process. All our classes are linked to the new EYFS framework meaning that your child will have the opportunity to progress in all areas of their development, giving them a truly holistic experience. Children love doing things together, by watching others they also learn a great deal – often finding out a better way of doing things. Wrapping the pose inside a story, means your child will get involved in the story and find the exercises more meaningful and hence more fun to do. In addition your child will have the chance to think about the different jobs people do in their community. 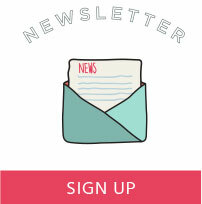 Find your local Tatty Bumpkin class here.